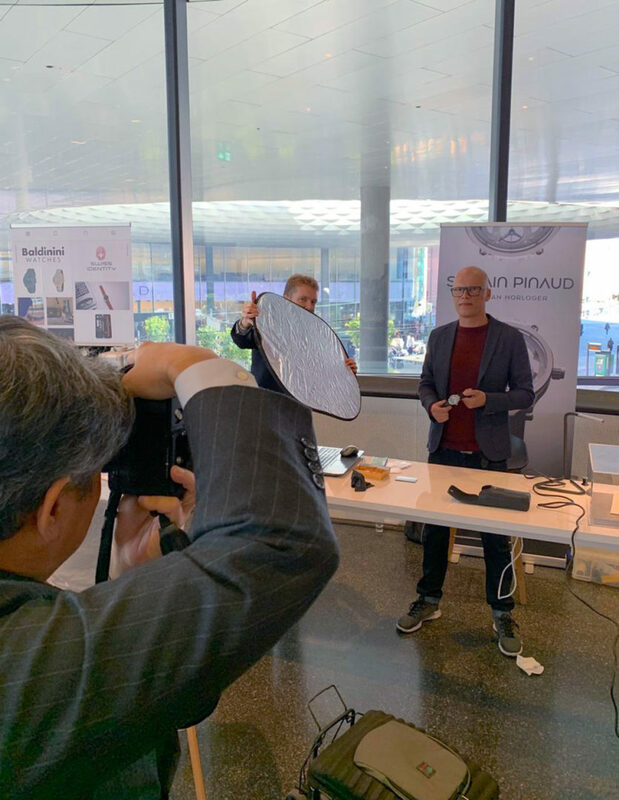 Follow-up to the Whats in my bag for Baselworld 2019 article where we revealed what we used to photograph the watches during the show, here is a behind the scenes look at how we shoot the watches using that gear. As described, the main camera is the Leica SL Type 601. This is a full frame mirrorless digital camera, with a sensor resolution of 24 Megapixels. The main lens we used was the Leica APO-Macro-Elmarit-TL 60 f/2.8 ASPH. This lens is designed for an APS-C sensor size, and the SL body automatically crops the image to a 10 Megapixel APS-C. This is still plenty of megapixels for online publication. Our typical photograph is 1024 x 800 pixels, less than 1 megapixel. The Leica APO-Macro-Elmarit-TL 60 f/2.8 ASPH lens projects a life sized image on the sensor. The photographs are processed in Photoshop Adobe Camera Raw CC, Bridge CC and Photoshop CC before being uploaded to our servers. The basic set up is as shown below. Typical set up used in a mega show like Baselworld or SIHH. This forms the Deployant mini-studio which is portable. 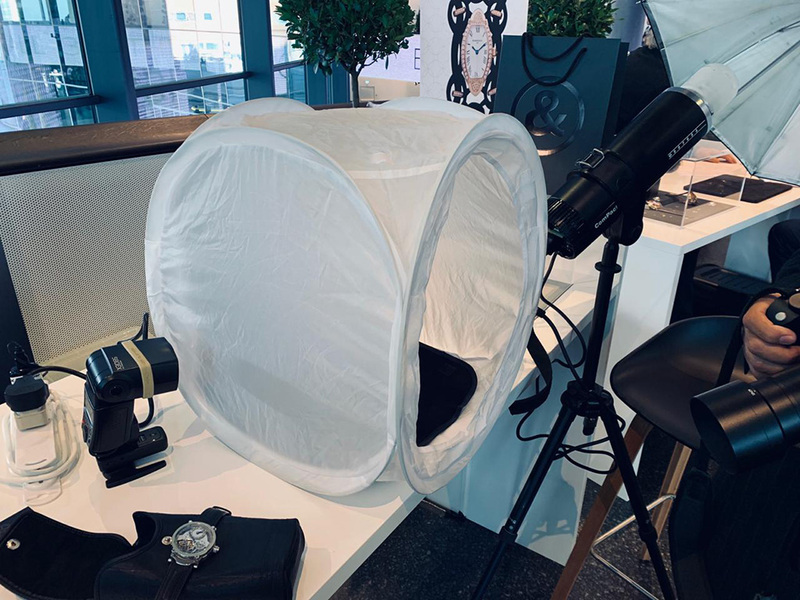 The watch is placed in a white, collapsible soft box with a black velvet serving as the background. As shown above, on the left is the Canon EX580 flash connected the Godox flash receiver. On the right is the Profoto Compact 600 flash with a reflective umbrella. This gives a large and very even light. The Profoto flash is mains connected, and is very powerful, about 5 times as powerful as the Canon EX580 at full power. And the Profoto gives even light at a very stable colour temperature from shot to shot. The camera is hand held. In the photograph above, the Leica SL is fitted with the Godox flash transmitter. This is a manual flash trigger, and only sends the flash signal. The Canon EX580 is set at 1/128 of full power and serves as the master flash as well as the fill light. The Godox transmitter sends the trigger signal to the receiver on the Canon, which fires the flash. The Profoto is set to fire when it senses a flash, so it also goes off. Typically the Profoto is set at the half power mark and serves as the main or key light. When shooting in a room with another flash, the Profoto in this configuration will fire when the other flash fires as well. To remedy this, a flash cord is connected from the Godox transmitter directly to the Profoto. 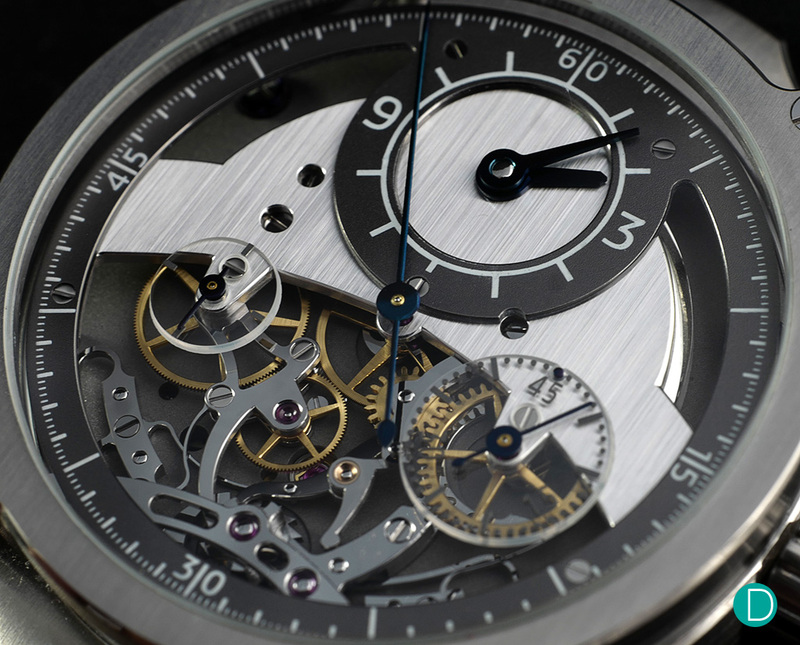 The Sylvian Pinaud Monopusher Chronograph, dial side, with the dial filling the entire frame. Note that even at f/11 the depth of field is not sufficient to render the entire dial in focus. However the details captured, and the colour rendition is excellent. The image requires only a small amount of adjustment on Photoshop CC. The Profoto is also equipped with an internal PocketWizard receiver, and can be used with the PocketWizard II Plus transmitter carried on n my bag. This is the back up flash system in the event of the Godox system failure. 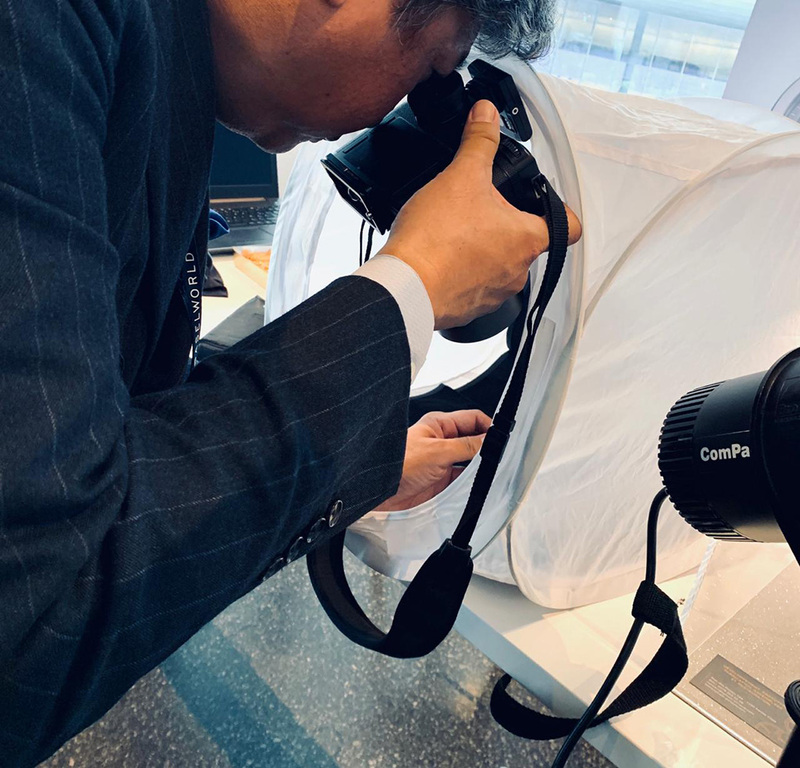 But for both SIHH 2019, and Baselworld 2019, the system has proven to be totally reliable. The Leica SL is set to Raw at the minimum ISO of 100 to minimize grain. The exposure is set manually at f/11 1/100s. The raw files are approx 18 to 42 Mb each. The raw image size varies depending on subject. On the standard camera used for our shoots, the Panasonic Lumix GH2, the ISO is set at the camera’s minimum of 160, and exposure at f/11 1/125s. For portraits a silver reflector, shown here held in place by an assistant is used to balance the light. Here the portrait of independent watchmaker Sylvian Pinnaud is being made. For portrait work, the Canon is usually placed behind the subject to provide background light and to separate it from the subject. And the main light is the Profoto, typically to one side and set high. A silver reflector is used as a fill on the opposite side of the Profoto. Camera is set to manual exposure, typically f/4 or f/5.6 at 1/125s ISO 100. Both scenarios are typical scenarios for shooting watch macros and for portraits. The setup may vary with the watch being photographed and the location of the portrait. Note: For full disclosure, all Leica gear used in Baselworld is on loan from Leica Singapore. And we received no compensation from them.